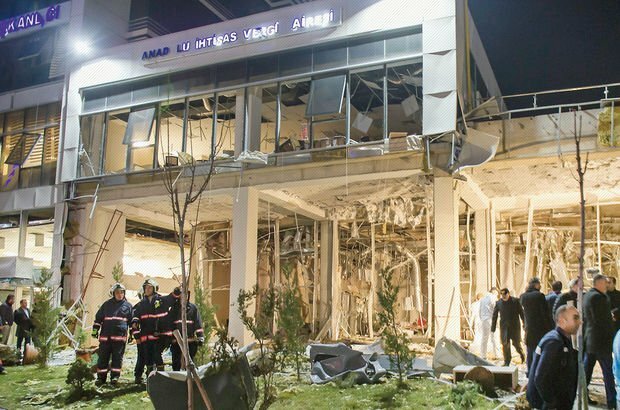 A Syrian man, Alan Chuckmaus, code-name "Ebu Serdar", was responsible for the explosion at a tax office in the Turkish capital Ankara on February 2nd, 2018 reported Fevzi Cakir, a reporter of Habertürk news. Haberturk claimed that Alan Chuckmaus, a.k.a 'Ebu Serdar', affiliated with PYD / YPG, was the one who gave instructions for the bomb attack to the tax office in Ankara. The newspaper reported that Chuckmaus had escaped to Syria just before the explosion, and Ersen Ertogan, the attacker, spent the night in an empty container. According to Fevzi Cakir's report, the explosives used in the bombing were brought in from Syria and were delivered to Chuckmaus. Chuckmaus through different channels later delivered the bomb material to Ertogan. The bomber Ersen Ertogan who committed suicide after the attack reportedly left the bomb system in front of the tax office January 31st. However, twice the bomb did not detonate, and Ertogan, on his third trial managed to discharge the weapon, according to Haberturk. On February 2, 2018, an explosion at a tax office in Ankara, initially believed to be a gas leak, was determined to be caused by a bomb. Turkish authorities, following the event in a statement, said that the suspected bomber had been killed in a police operation. Next day, Ankara governor's office, in a statement said that the police detained eight people suspected of links to the alleged bomber. The governor's office's statement identified the suspect as a man trained with Kurdish militants in Syria. The tax office attack that came as Turkey's military pushed ahead with an offensive into northern Syria to rout a Syrian Kurdish militia group that the Turkish government says is linked to outlawed Kurdish rebels in Turkey, did not cause any causalities.